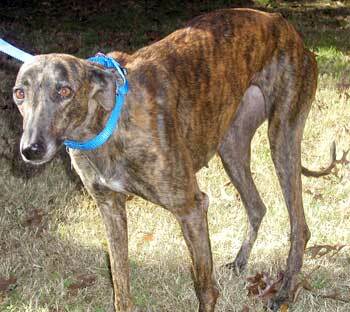 Valerie is a dark brindle female greyhound estimated to be about 2½ years old, as she is not tattooed. 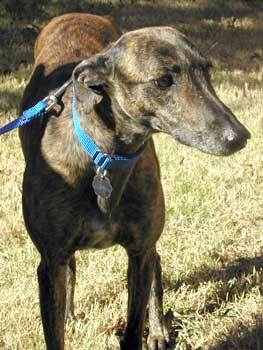 Valerie was found as a stray along with Kay and Fannie huddled in a ditch in an area south of Fort Worth. Like Fannie and Kay, Valerie came with medical problems, in that she was heartworm positive. Her treatment has been completed and was successful! She is ready to find her forever couch. Although Valerie is not cat tolerant, she appears to get along well with small dogs.